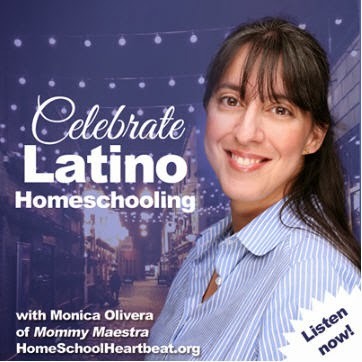 If you are a homeschooler, you've probably enjoyed a summer break for several weeks or more now. So if you are like me, your thoughts are beginning to turn to the coming school year. You may be thinking about curricula and planning extracurriculars. So I wanted to share with you a new resource available for those of you with high schoolers. Earlier this year, I told you about the study guides for the CLEP tests that are available from Study.com. Today, I want to tell you about an additional test prep resource for students looking for college credit through DSST exams. The DSST Program allows students to gain college credit for their prior knowledge or learning that happens outside the traditional classroom. While some test areas overlap with CLEP (like college calculus), there are also some DSST exams that don't have CLEP equivalents, like technical writing, public speaking, and several specific history exams, like "History of the Vietnam War". So let's take a look at the actual courses. 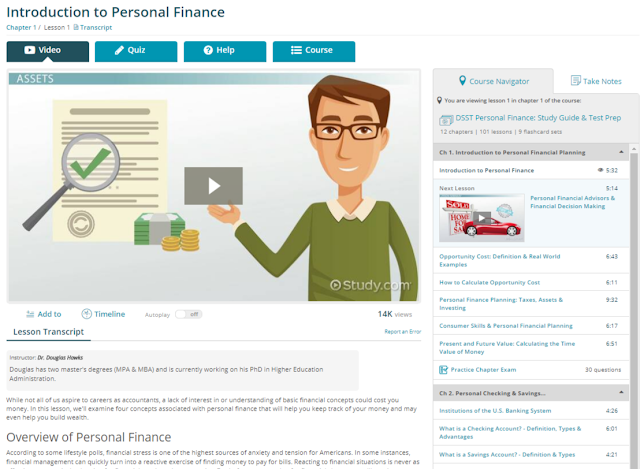 I selected DSST Personal Finance because I think that ALL children should take this course in high school and before they leave home to be on their own. 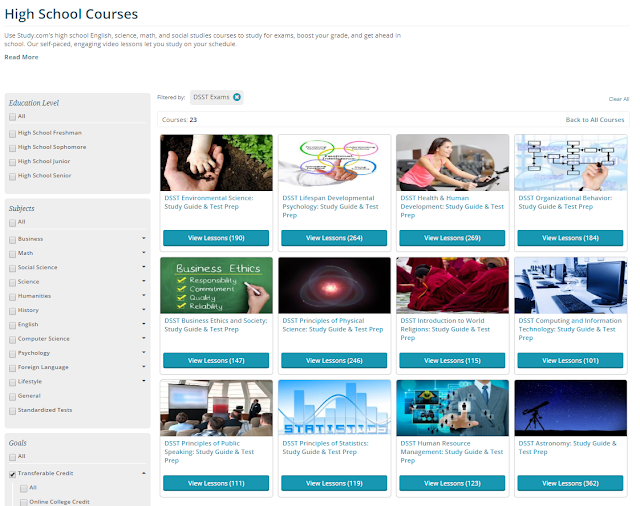 The overview tab includes a course summary with a brief description of what you'll be learning. You'll also find your Progress Tracker on this page. The great thing about this course is that you can go as fast or as slow as you'd like. And when you finish for the day, it notes where you stopped so that the next time you login, you just open this page and click on "Your next lesson" to pick up where you left off. It also tracks the number of quizzes you've completed. 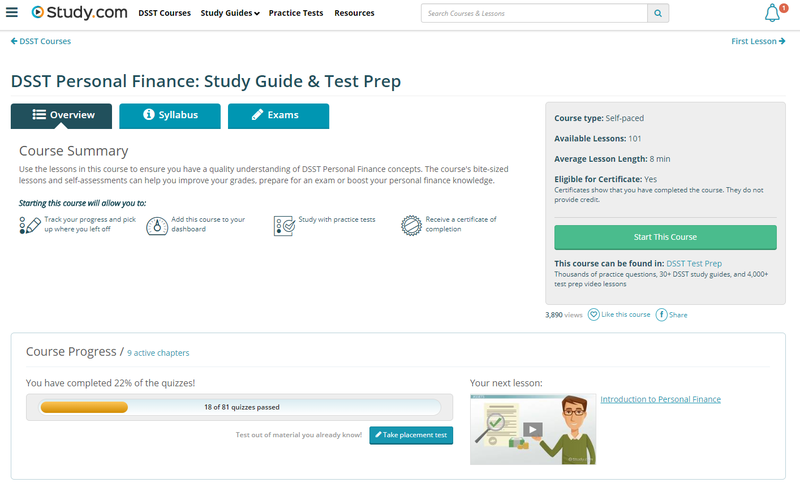 Before you begin the lessons, you can click on "Course Practice Test" to check your knowledge of this course with a 50-question practice test. After you complete the test, you'll immediately see your score, how long it took you to complete the test, and your areas of weakness and strength. You'll also see which questions you got wrong, the correct answers, and the option to watch the video that explains the correct answer. 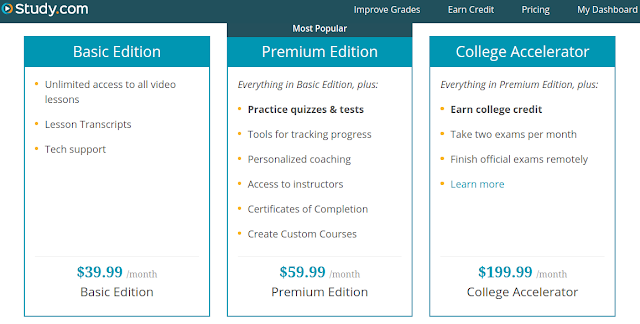 On the overview page, you can also see that this course has 12 chapters and each chapter has anywhere from five to 12 lessons. Each lesson has a quiz at the end. This page gives a more detailed description of the course. But what I really like is that it also includes a section called "Course Uses" which gives a bulleted list of all the benefits of taking the course. There's also a list of the course topics. 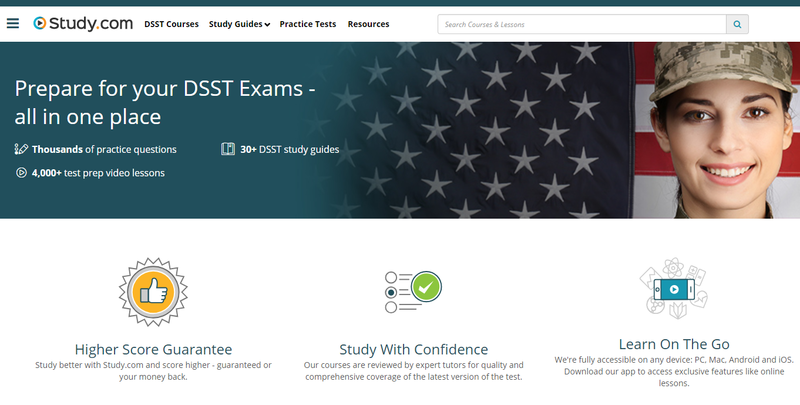 This page lists all of the tests and quizzes available for this course. 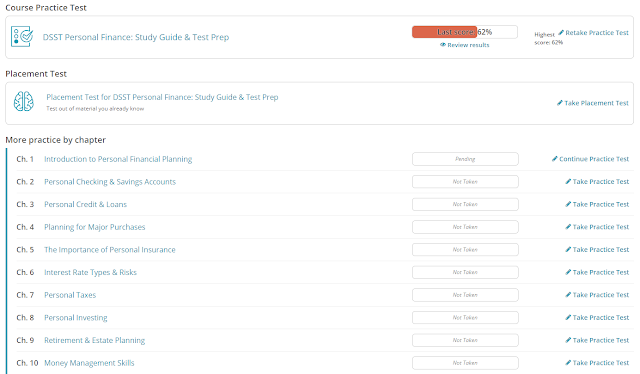 If you feel that you already know quite a bit, you can take the Placement Test to see which lessons you need to cover. And of course, you can find all the practice tests for each chapter. The actual lessons are presented in a simple and easy to understand format. There's a short video to watch, followed by a lesson transcript so you can review what you've just learned. But if you prefer to take your own notes, there's a little tab on the upper right corner that allows you to type up things you think are important or questions you want to research later. You can try it out yourself with their five-day free trial. And I do encourage you to try it. But be sure to cancel your subscription if you decide it's not for you or your child. 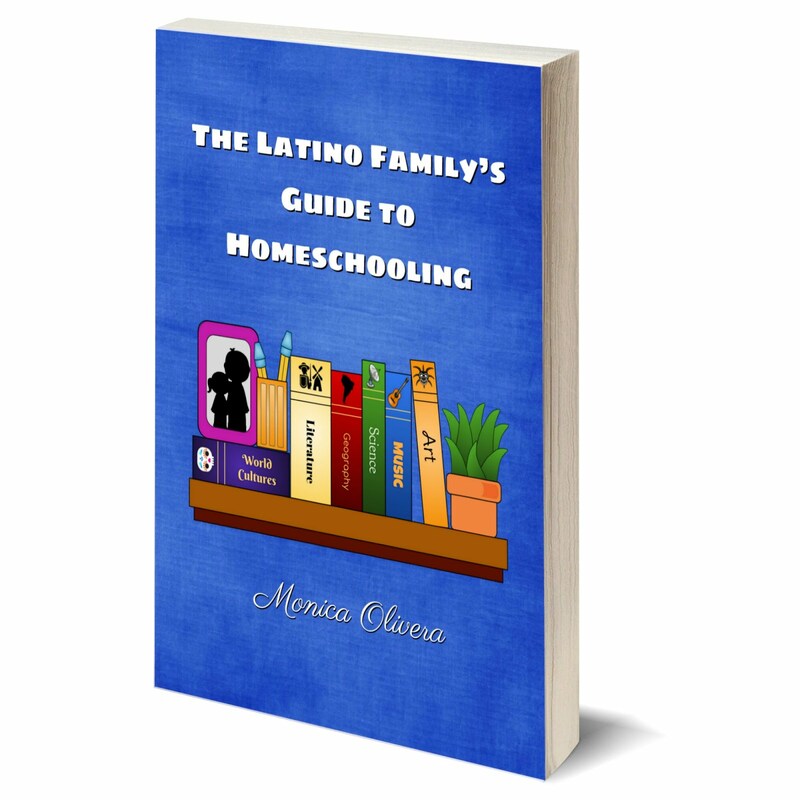 Overall, this is a fantastic resource for homeschoolers! I think the video courses are perfect for students and deliver the information in a way that is easily understood. And I always love it when my kids can earn college credits and SAVE US TIME AND MONEY! So don't wait. If you think this is the right tool for you to incorporate into your homeschool, head over to Study.com to learn more and sign up! Over the years, my daughter and her friends have devoured various book series whose main characters were animals. I've wondered if it was the idea that their beloved pets were out living adventurous lives that kept the kids mesmerized, anxiously awaiting the next book in the series to be published. How clever, I thought, those authors are to turn animals into heroes and villains.
) The storyline focuses on bullying. Let me tell you the storyline first. 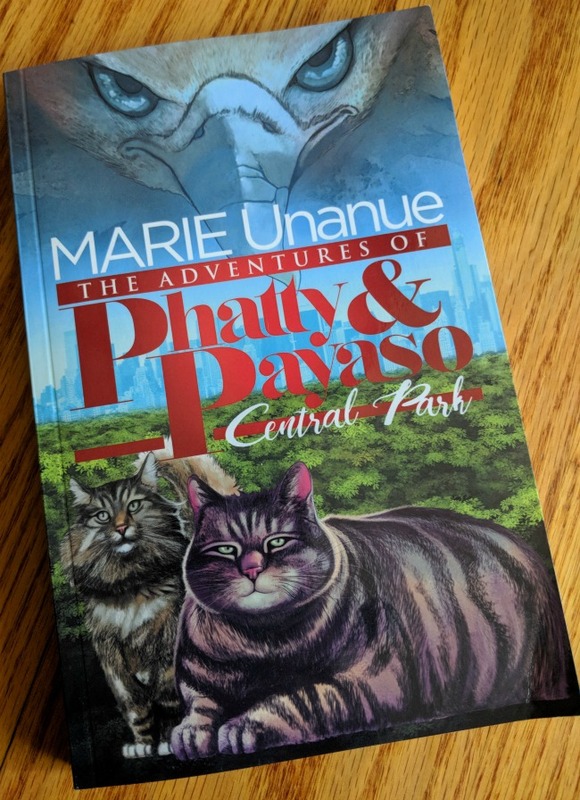 So the main character, Phatty, is a fat cat who loves to spend his time sitting on his favorite chair and gazing out the window at Central Park. One day, the meanest hawk around lands in his window and begins to threaten him and his friends. At first, Phatty is terrified, but eventually, he musters up his courage to go alone to Central Park to stop the bully. When he doesn't come back, Payaso sets out to find his best friend, Phatty. Self-control: Regulating what one feels and does in the service of goals and standards; being disciplined; controlling one's emotions. The characters in the book each reflect one or more of these traits and they teach them to each other...and hopefully the reader, too! For kids who may be suffering (or who have suffered) from bullying, this is a great resource. This week has been a cruel reminder of why Latino authors (and other authors of color) are so important to the literary field. The youngest and most vulnerable members of our global society need people who are willing to share their stories so that others might find their way to understanding and compassion. Specifically, of course, I'm talking about immigrant families, especially children. 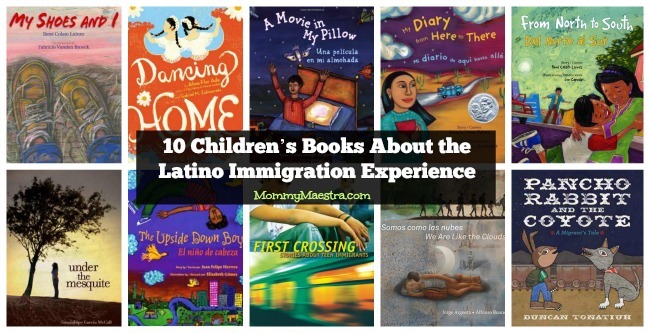 So here is a list I've compiled of the remarkable books about the immigration experience as seen through the eyes of Latino children. 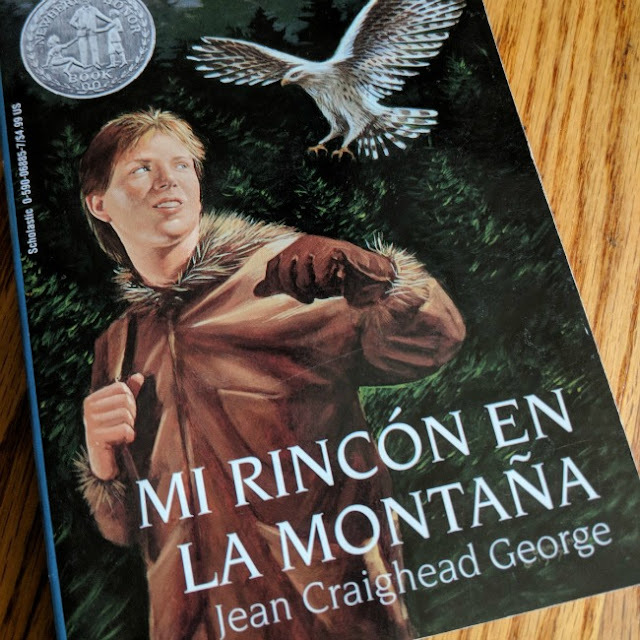 I think it is a good time for me to share it so that others looking for these beautiful and difficult stories can share them with all the children they know. A timely and inspiring story. Mario is leaving his home in El Salvador. With his father by his side, he is going north to join his mother, who lives in the United States. She has sent Mario a new pair of shoes. He will need good shoes because the journey north will be long and hard. He and his father will cross the borders of three countries. They will walk for miles, ride buses, climb mountains, and cross a river. Mario has faith in his shoes. He believes they will take him anywhere. On this day, they will take him to the United States, where his family will be reunited. Near the border, the cars began to move very slowly. Papá, go fast. I want to see Mamá, I said. José loves helping Mamá in the garden outside their home in California. But when Mamá is sent back to Mexico for not having proper papers, José and his Papá face an uncertain future. What will it be like to visit Mamá in Tijuana? When will Mamá be able to come home? 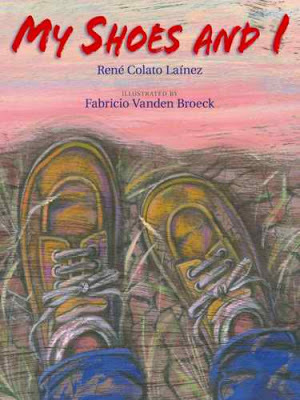 Award-winning children s book author René Colato Laínez tackles the difficult and timely subject of family separation with exquisite tenderness. René is donating a portion of his royalties to El Centro Madre Assunta, a refuge for women and children who are waiting to be reunited with their families up north. 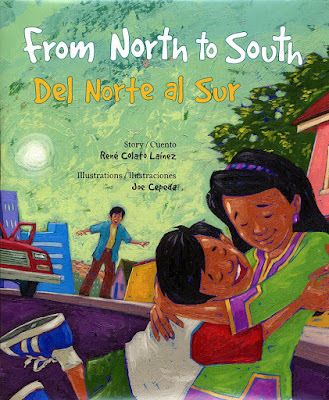 Joe Cepeda s bright and engaging illustrations bring this story of hope to vivid life. 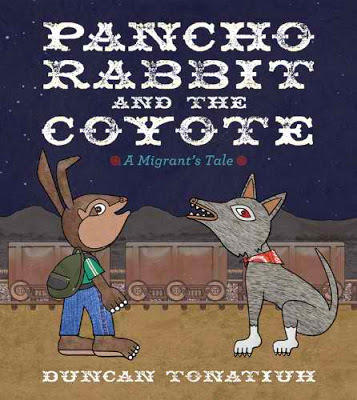 Duncan Tonatiuh brings to light the hardship and struggles faced by thousands of families who seek to make better lives for themselves and their children by illegally crossing the border. One night, young Amada overhears her parents whisper of moving from Mexico to the other side of the border to Los Angeles, where greater opportunity awaits. 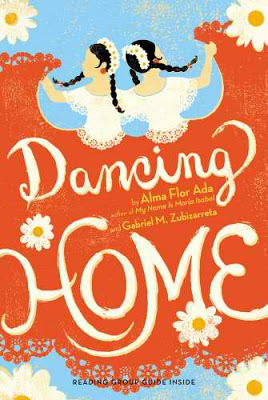 As she and her family make their journey north, Amada records her fears, hopes, and dreams for their lives in the United States in her diary. How can she leave her best friend behind? What if she can't learn English? 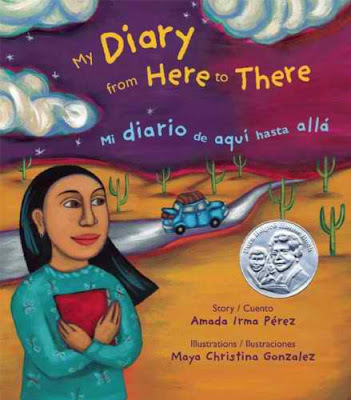 What if her family never returns to Mexico?From Juárez to Mexicali to Tijuana to Los Angeles, Amada learns that with her family's love and her belief in herself, she can make any journey and weather any change here, there, anywhere. 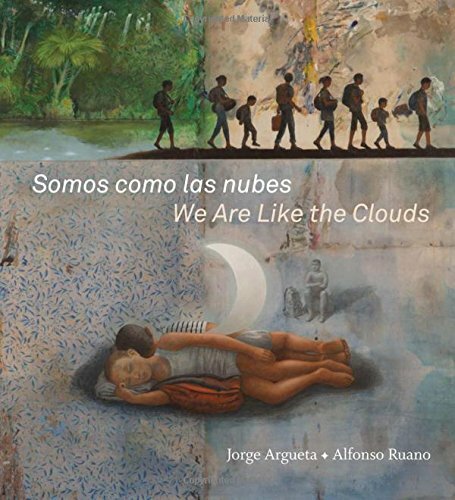 A young boy with two homelands and a delightful sense of wonder comes to life in Jorge Argueta s first collection of poems for children. Young Jorgito lives in San Francisco s Mission District, but he hasn't forgotten his native El Salvador. He recalls the volcanoes, the tasty cornmeal pupusas, and his grandmother s stories. 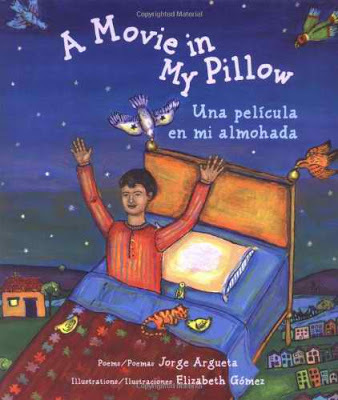 As he changes from timid newcomer to seasoned city dweller, Jorgito s memories and new adventures form a patchwork of dreams the movie in his pillow that is perfectly suited to his new bicultural identity. 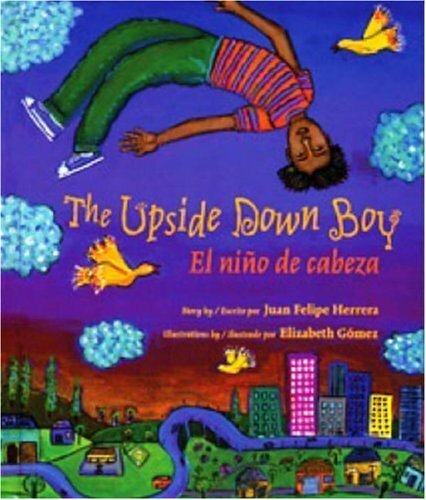 The Upside Down Boy is award-winning poet Juan Felipe Herrera's engaging memoir of the year his migrant family settled down so that he could go to school for the first time. Juanito is bewildered by the new school, and he misses the warmth of country life. Everything he does feels upside down. He eats lunch when it's recess; he goes out to play when it's time for lunch; and his tongue feels like a rock when he tries to speak English. But a sensitive teacher and loving family help him to find his voice and make a place for himself in this new world through poetry, art, and music. Juan Felipe Herrera's playful language and the colorful, magical art of Elizabeth Gómez capture the universal experience of children entering a new school feeling like strangers in a world that seems upside down-at first. 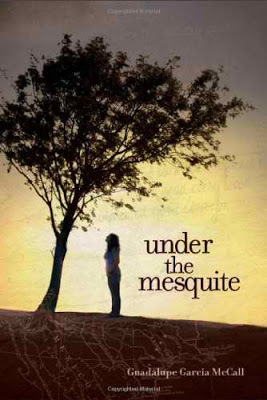 Lupita, a budding actor and poet in a close-knit Mexican American immigrant family, comes of age as she struggles with adult responsibilities during her mother's battle with cancer in this young adult novel in verse. Fleeing from political violence in Venezuela, Amina and her family have settled in the United States. Sarah, adopted, is desperate to know her Korean birth parents. Adrian’s friends have some spooky — and hilarious — misconceptions about his Romanian origins. 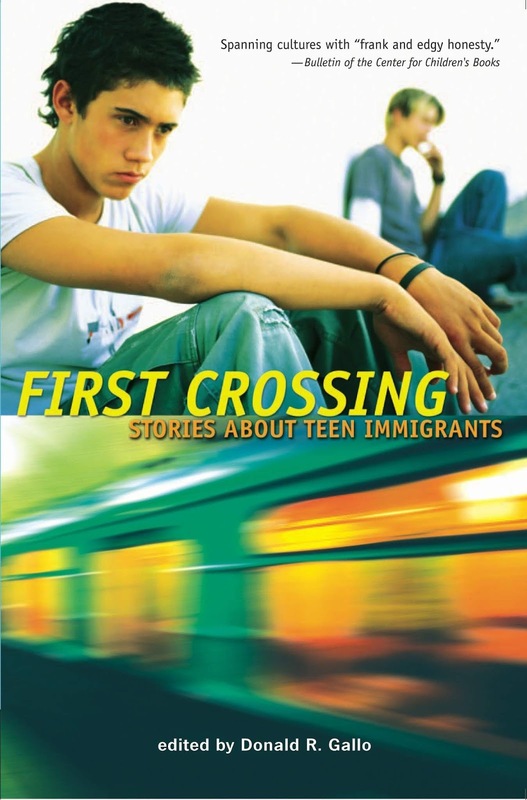 Whether their transition is from Mexico to the United States or from Palestine to New Mexico, the characters in this anthology have all ventured far and have faced countless challenges. Each of these stories is unique, and each one has something to say to all of us. 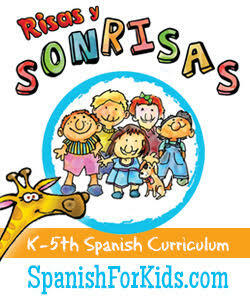 Thinking about starting Spanish lessons with your child or students this coming school year? 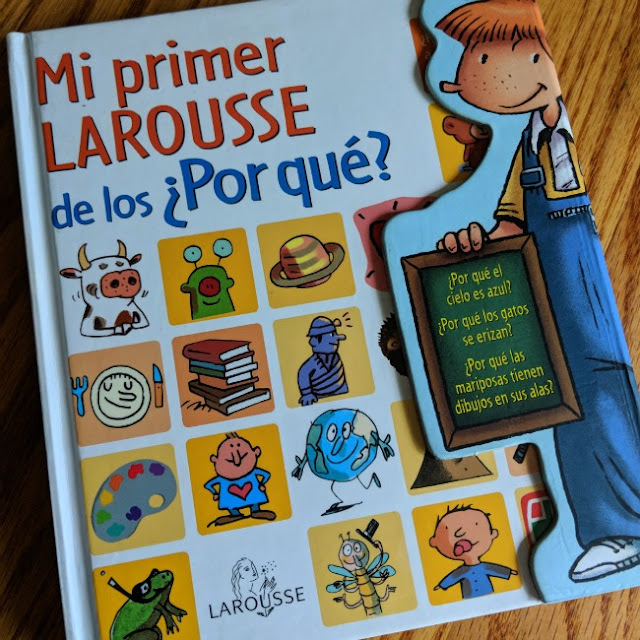 Then let me tell you about another new Spanish curriculum, whose creators recently reached out to me and asked me to take a look at their program. 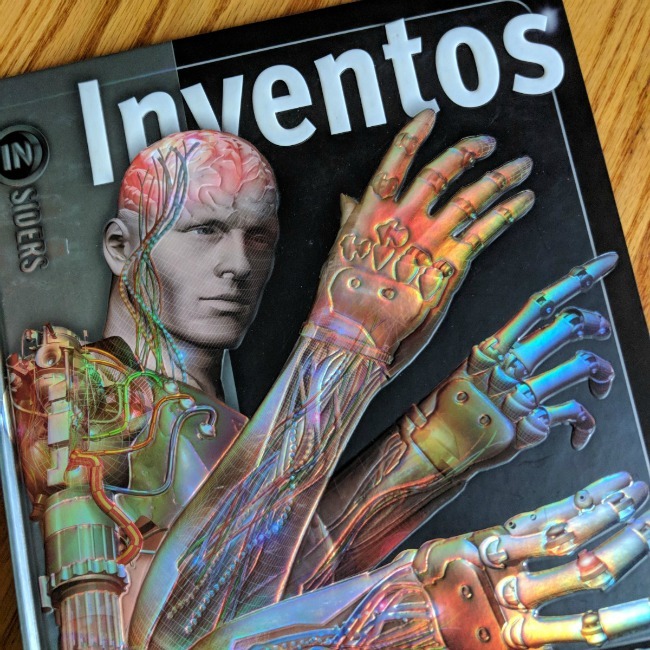 Today's sponsored post is written in partnership with ¡Vámonos!, but all thoughts and opinions are my own. ¡Vámonos! is a new activity-based Spanish course for kids that uses an adapted immersion approach. I've reviewed quite a few programs over the years and each one is different. Some are literature based while others focus on TPR. Some only use videos, while others offer multimedia resources. What I really love about the ¡Vámonos! program is that the lessons are completely centered around activities that engage young children. 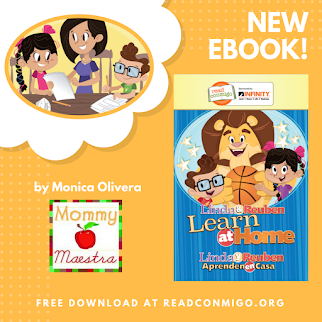 From games and art to outdoor exploration and cultural activities, the lessons are designed to be fun and help children quickly learn grammatical patterns and vocabulary. There aren't a lot of materials that come with this program, which helps reduce the cost. Though you will have to provide many of the tools used in the lessons. For example, you would need to have access to an indoor ball, colored paper, marbles, craft supplies, etc. Most everything is something that you probably have already if you have/teach children in the elementary grades. several more activities (up to 7 total) that teach and reinforce the concept being learned. and immersion tips to help teachers create a functional immersion classroom. 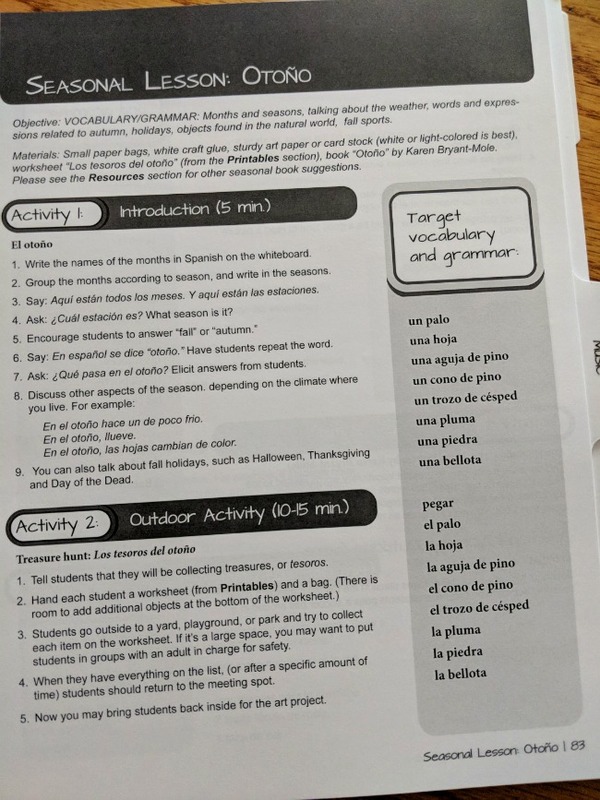 The number of activities varies from lesson to lesson because some are games or crafts, others are stories or songs, and others might be "Pair Work" that encourage students to pair up to practice speaking Spanish. I don't think I saw any activities that lasted longer than 15 minutes, which is perfect considering the age of the students for whom this program is intended. In total, each lesson is designed to last 50 to 60 minutes. As you can see, the focus is on counting. Specifically, the lesson concentrates on teaching students to learn how to ask how many or answering/telling how many. 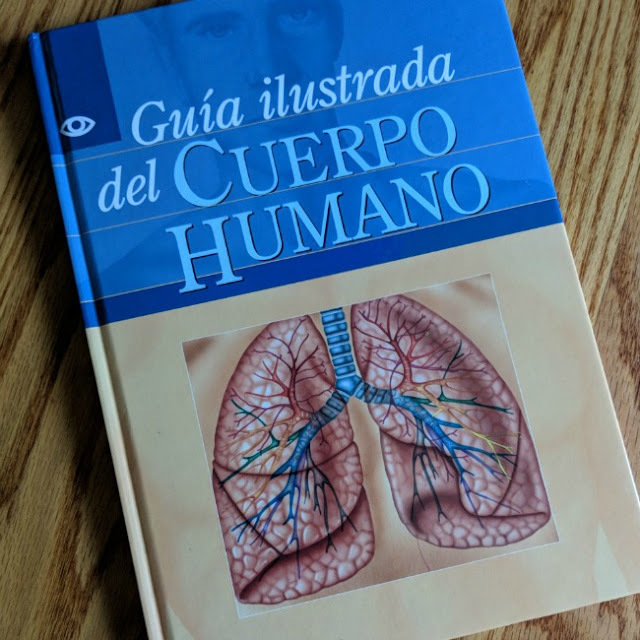 It's not just vocabulary, but rather how to actually have a conversation in Spanish. I like that you can see a list of the target vocabulary and grammar straight away in the sidebar. And I appreciate that the lesson gives an estimate for how long each activity should take. I absolutely love that the program creators have added a separate section for seasonal lessons. That means that these lessons can be used at ANY time during your school year. If you are a homeschooler who starts these lessons in summer, you can just flip to that lesson and boom. You're ready to go! Or if you start this in the winter, no problem. 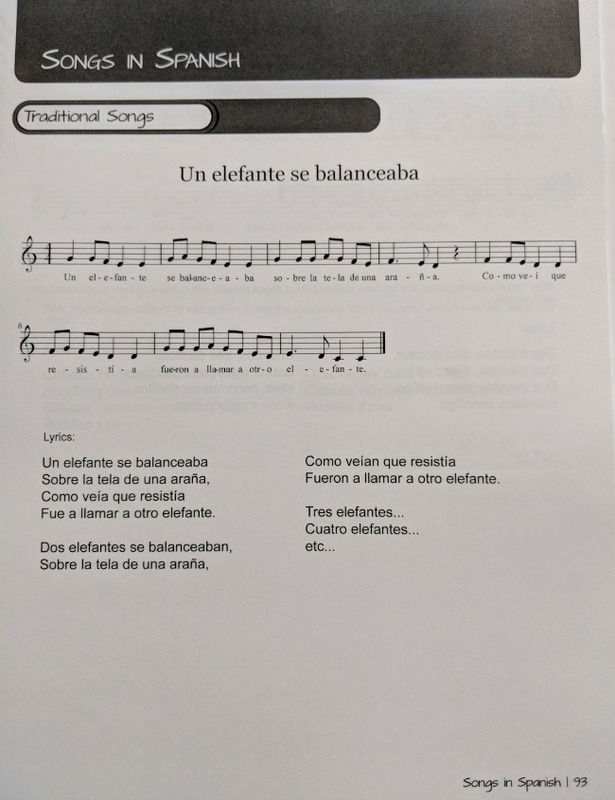 The music section contains both the lyrics and scores for traditional children's songs from Latin America, with a few modified ones from the U.S. thrown in. 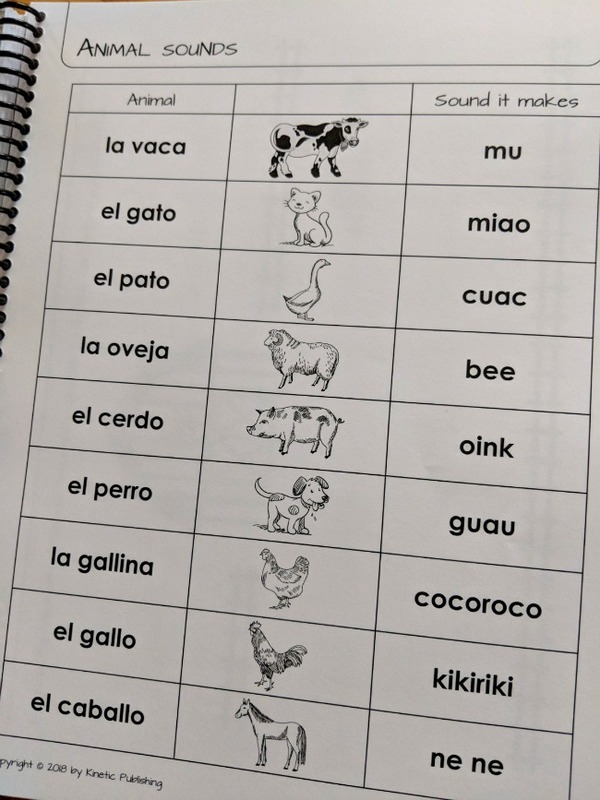 But, yes, they are all in Spanish. Fun, fun, FUN! I love all the games, which include popular ones from Latin America. Some are meant to be played inside, while others are best done outside. And the creators have been nice enough to include links to online demonstrations where needed, such as with jueguemos en el bosque and la olla de los frijoles. 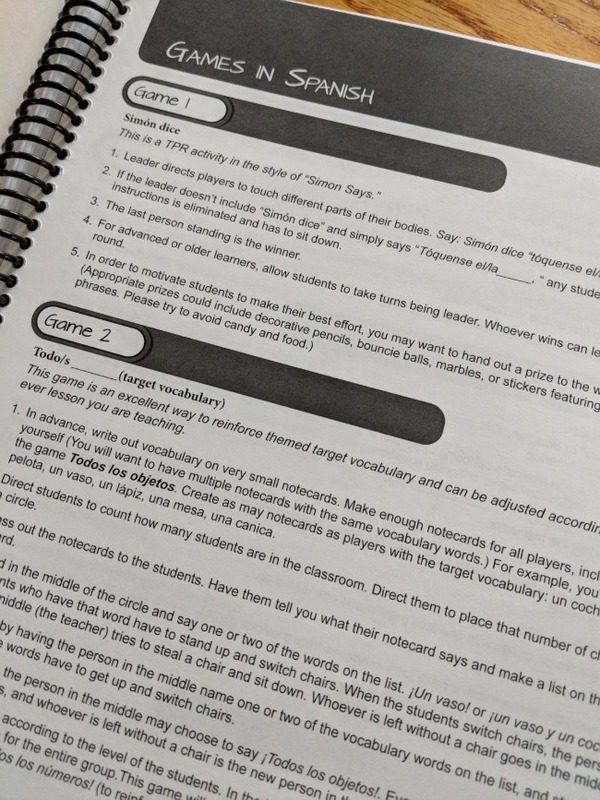 Of course, many of the activities in the lessons just need a printable resource, so this section includes all the blackline masters. Just choose the one you need and make as many copies as necessary for you to use in your classroom. 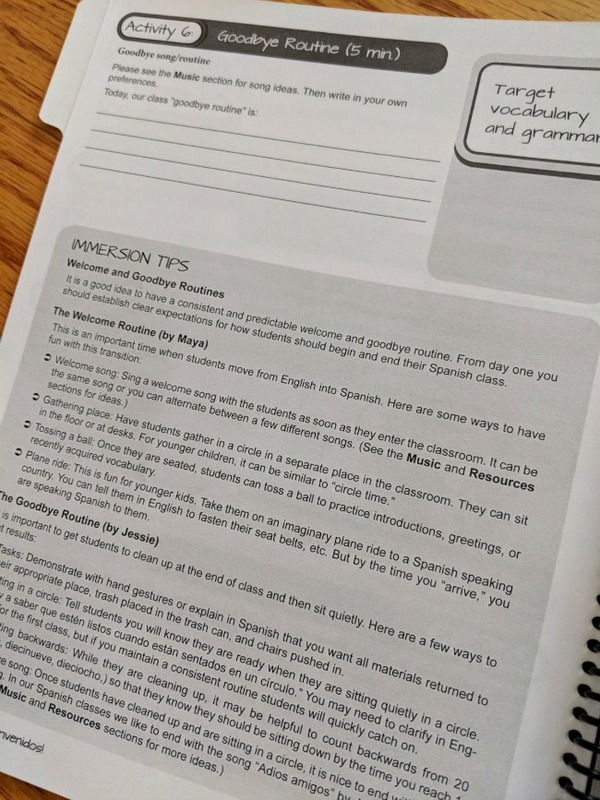 And finally, we have the Resources section which includes a list of the suggested Spanish books used in the lessons, a list of music products, useful books and articles, as well as a list of craft websites. Overall, I think this curriculum would be great for homeschool co-ops and community groups, as well as traditional schools. 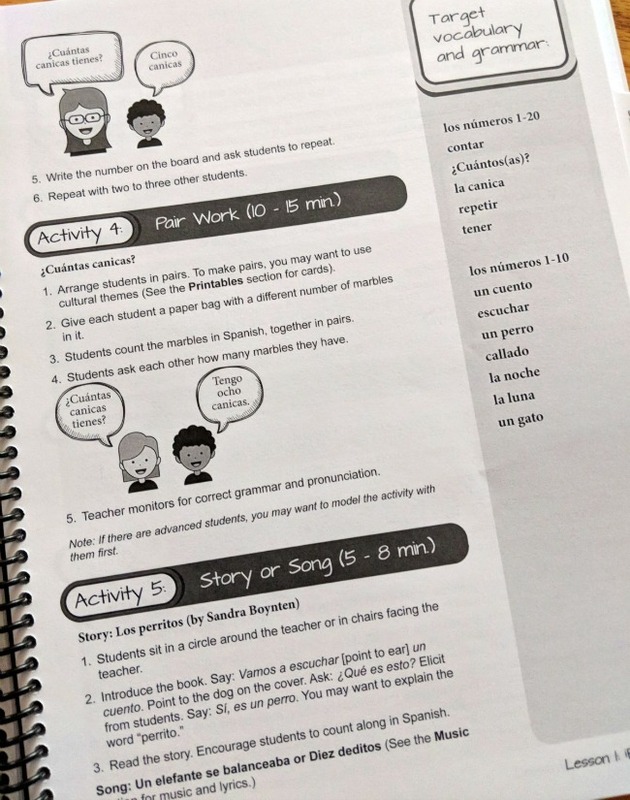 Does the teacher need to be fluent in Spanish? Yes, or at least they need to be familiar enough with the language to create an immersion-style classroom. 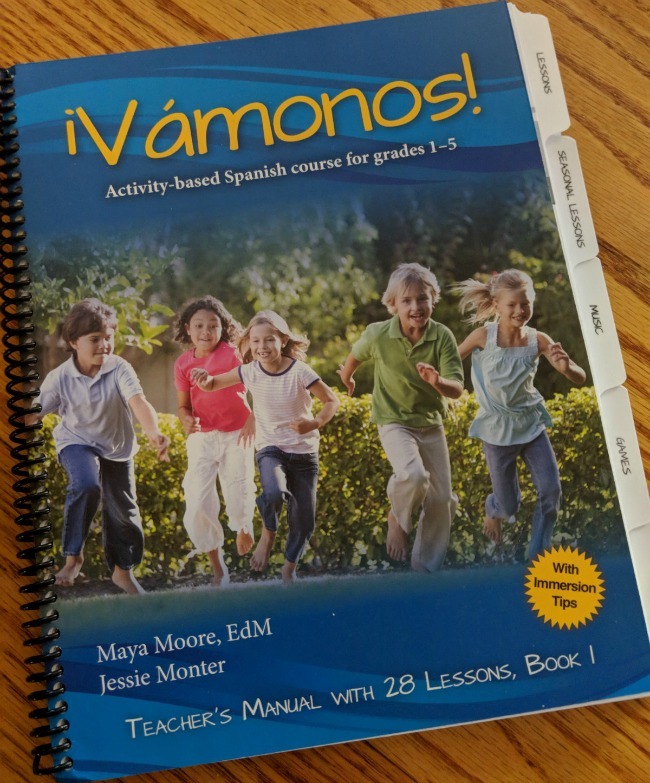 If you'd like to purchase Book 1 (described here), learn more about the program, or download a sample lesson, visit VamonosForKids.com. Disclosure: I received a copy of ¡Vámonos! Book, 1 for review purposes. All thoughts and opinions are my own. 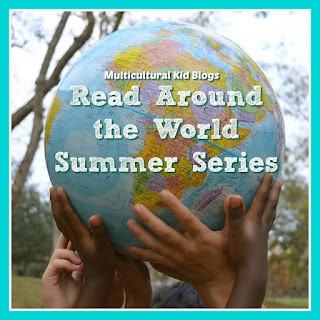 One of my favorite series to participate in is the Read Around the World series by Multicultural Kid Blogs. 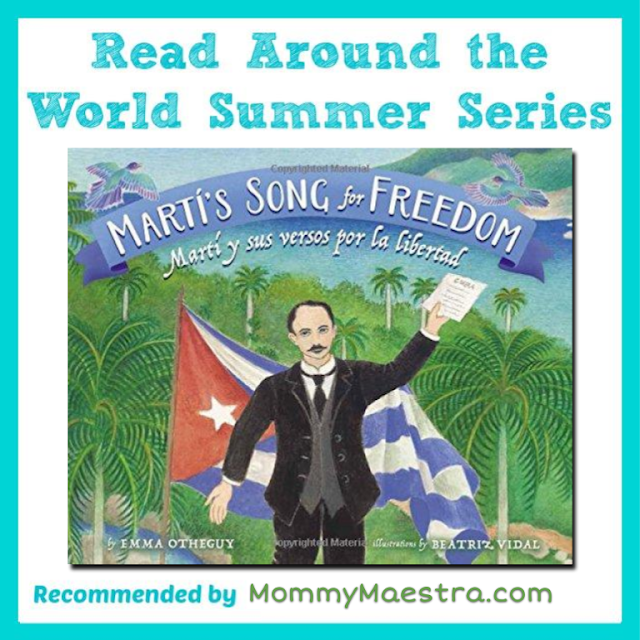 I love following along and learning about amazing books recommended by bloggers scattered across the globe. It is a way for me to introduce my children to other countries and travel the world without leaving our living room. The books represent countries far and wide. From Egypt to Indian to Sudan to Japan, these books are such a delight to read and so different, reflecting the diversity of cultures worldwide. My selection for this year is shown above. I really loved this book and am happy to recommend it to everyone. I hope you enjoy it! 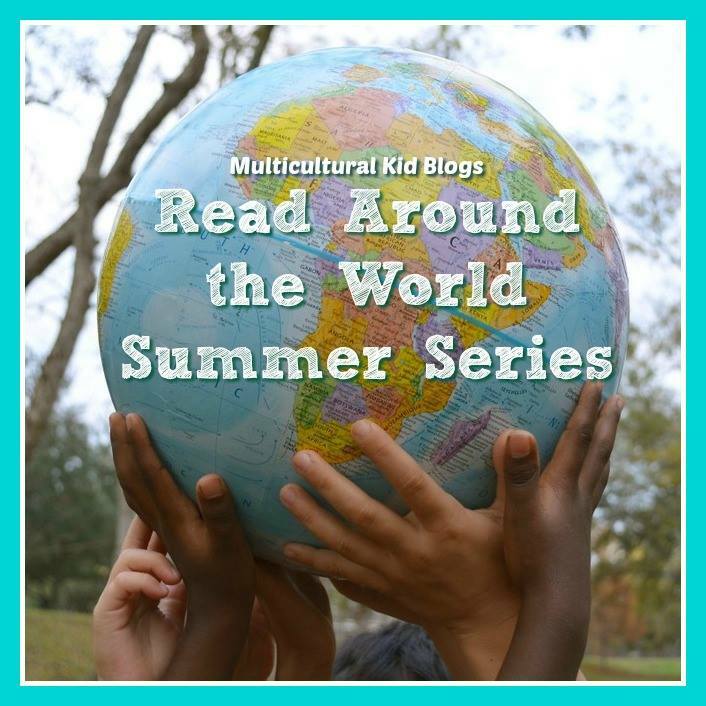 If you'd like to follow along, too, visit MulticulturalKidBlogs.com or the hashtag #ReadtheWorldMKB on your preferred social media channel. 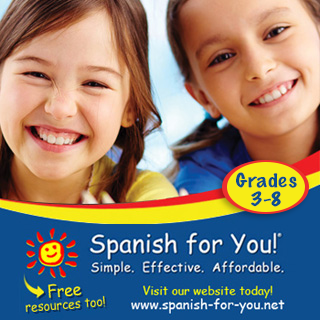 Fortunately, we have this month's freebie from MM sponsor, Spanish for You! to help you! It is the final one in a series on Spanish vowels. You can find all the other mini-lessons here. Or visit the Spanish for You! website for more awesome Spanish lessons. 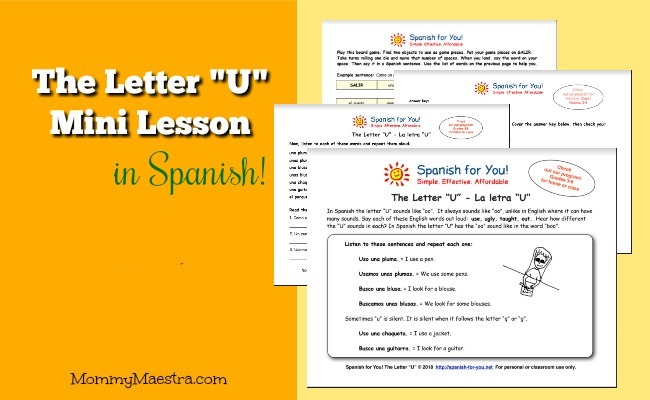 Today's download is a 4-page mini-lesson to help Spanish learners use and pronounce the letter "U." 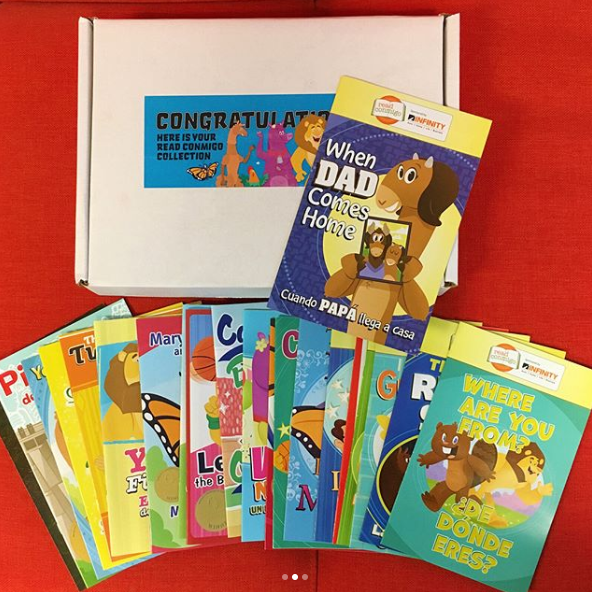 The file comes with an introductory page that is to be used with the audio file to learn how to pronounce the letter U as it is used in words and sentences. 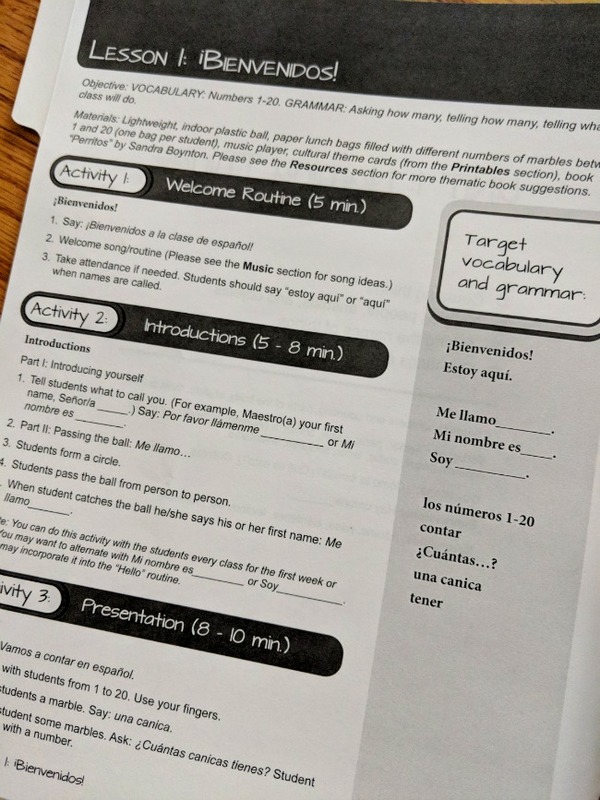 There are also two worksheets that allow you to practice reading and writing in Spanish, as well as and a fun board game. As always, there is also an audio file to help you learn the proper pronunciation. 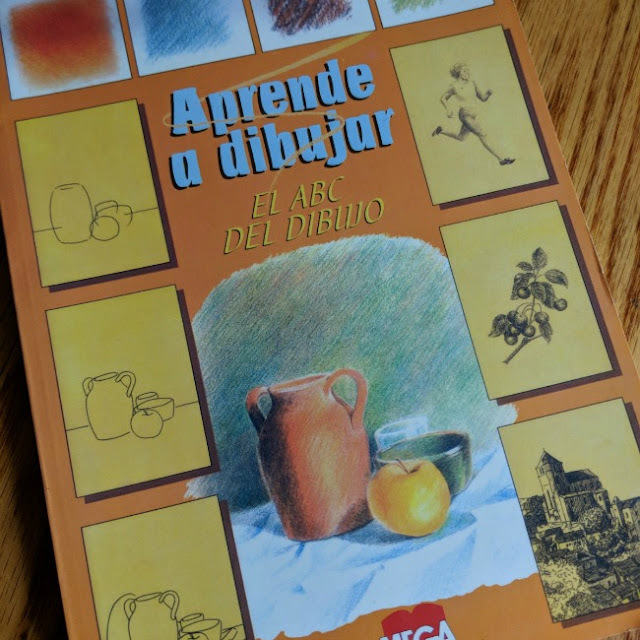 And if you are looking for books about the Spanish vowels, check out this post! I'm over at Spanish Playground this week with a free download! 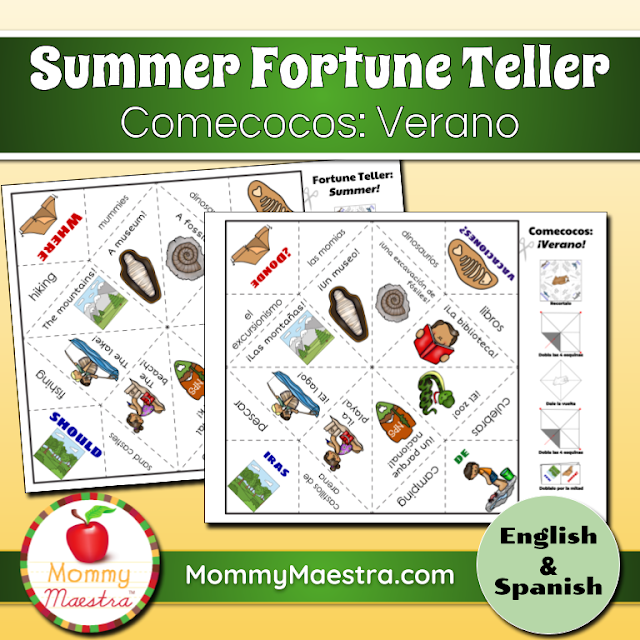 Celebrate summer and boost Spanish or English vocabulary with my printable fortune teller/comecocos. It's fun!